Dam: SG Little Tots Estate ST Tiqvah 2*M *DAR 91.3Ex, 2016 ADGA Elite Doe. I am super excited about this lovely doe. Frona was born on St Patrick's Day and since my Grandma was Irish, it was an easy decision to pass on her wonderful name: Saphronia, lovingly referred to as Frona. That being said, we have absolutely adored this doe's mama, Tiqvah, which means "Hope" in Hebrew. She represents the very best from Rusty & Lucy Repp of the Nationally regarded Little Tots Estate. As her pedigree suggests, Hope has been spectacular as a producer, milking over 1000# in each of her first two lactations, earning her a spot in the National Top 10, both in ADGA & AGS, and a GOLD in the ANDDA JuJu awards. We were beyond thrilled when we found out she was awarded the Superior Genetics (SG) Award. Hope also earned great scores on her Linear Appraisal with an Excellent for Shoulder Assembly, as well as Dairy Strength. Frona's brothers have sired some of our nicest babies last year, each earning their "+" status as Sires. 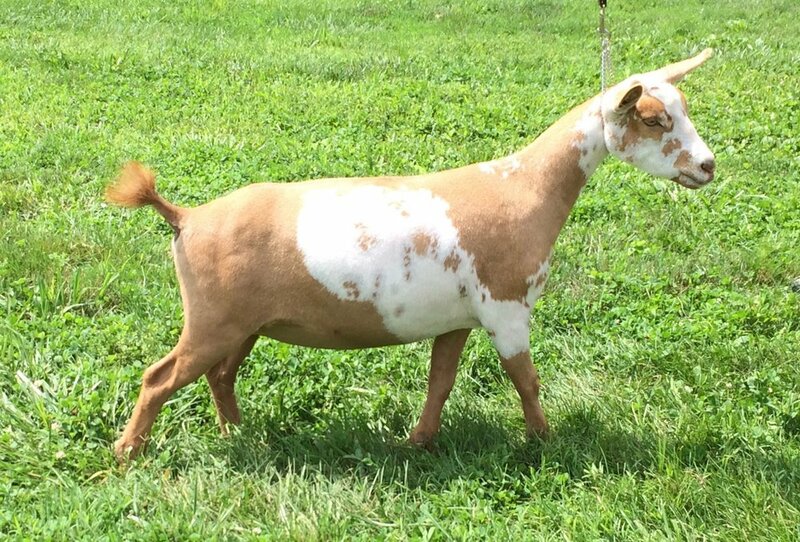 And we are thrilled with this pretty moonspotted doe's progeny so far. 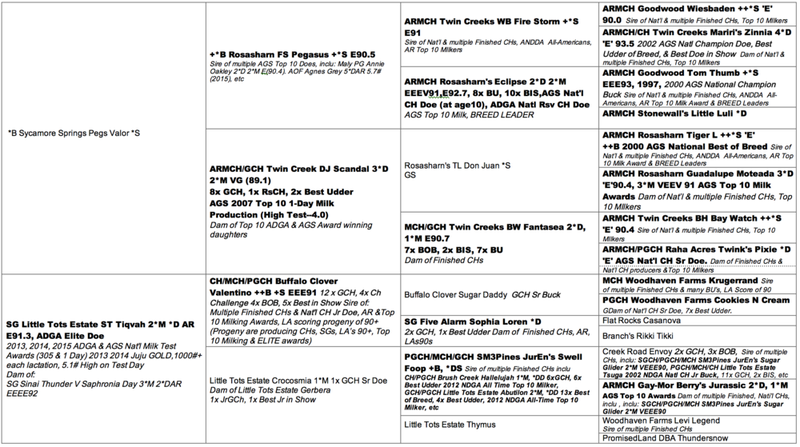 Frona's Sire represents the "who's-who" in the National Show Ring as well as Milking Awards. Valor's Dam is a a dual Finished Champion and her Dam line is simply superb. Rosasharn's legendary finest fill out the rest of the sire's line. Valor's paternal Half-sister just milked 5.7# on her Milk Test Day and Pegasus himself classified as a E90.5, as his sire and dam were both 91's, with their parentage in the 90's and 93.